Many of us are visual learners. And a picture is worth a 1000 words anyway ! This got me to thinking of a universal graphic that could deconstruct & represent Stitches/Techniques. This simple right-angle symbol seems to be easy & perfect to showcase Many different stitches, including some advanced ones. It is still a work in progress. But here is the 1st 'unveiling' .... 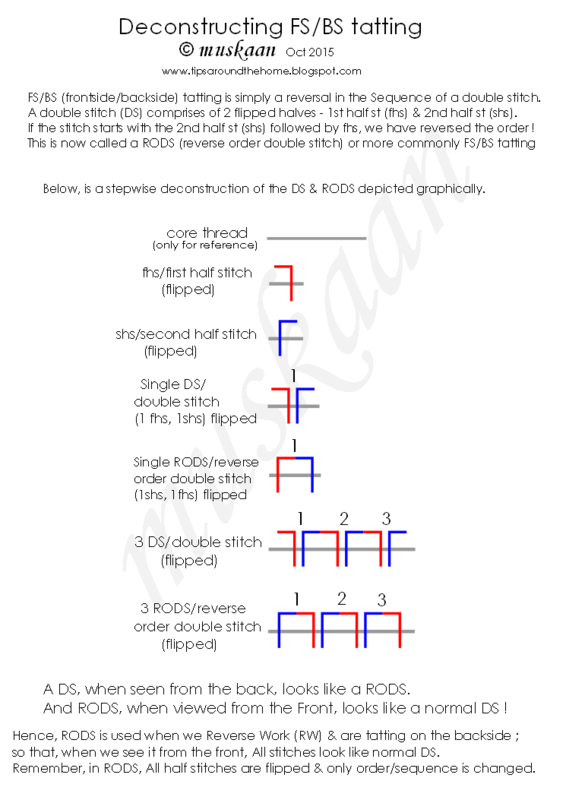 It is meant to understand & compare a normal double stitch (DS) with a Reverse Order DS (RODS) commonly called FS/BS tatting. I am uploading a picture, but for better visual, it is also presented as a pdf file which can be downloaded here. A ring and chain pattern usually calls for RW (Reverse Work). 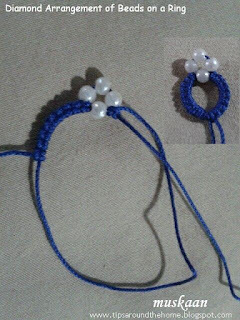 The element we start tatting with (let's say a ring), can be considered to be the front of the project. Now, when we RW (to make a chain, suppose), we go from the front to the back side of the project. If we continue with the normal DS, they will look like RODS when viewed from front. 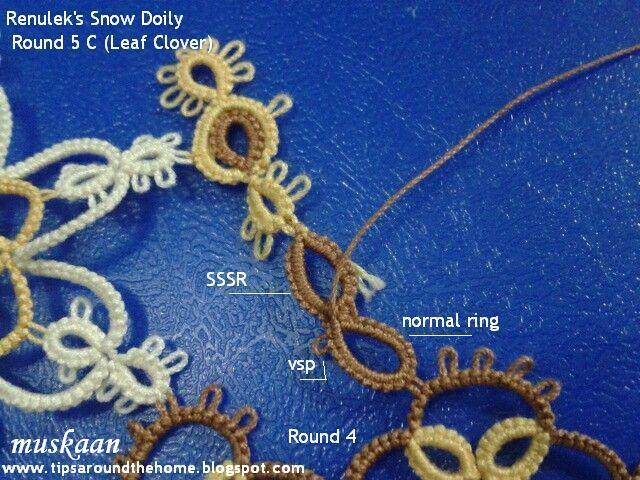 The pattern may next ask for RW again, to make 2nd ring. So, we've switched to the front again, and normal DS will appear complete. Thus, in 'traditional' tatting, in terms of stitches, there is no Distinct front or back .... some elements have complete ds, some seem to have incomplete DS, despite the fact that the Number or Count of stitches is a complete numeral according to pattern. right motif is as seen from the front . 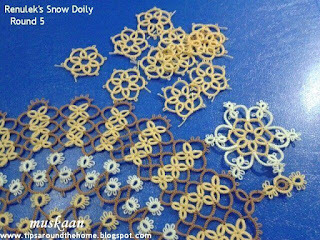 Now, since DS viewed from Back looks like a RODS, and conversely, RODS is nothing but a normal DS when viewed from the other side, we started to use RODS when tatting from the back. Hence in the description above, the ring is tatted in DS, RW, chain is tatted in RODS, RW, ring again in DS, and so on. 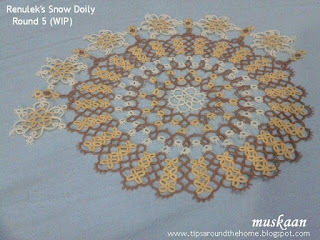 ALL the stitches, when viewed from the Front of project, look like complete DS. And ALL the stitches, when viewed from the Back of project, look like RODS ! Thus we have a project with a DISTINCT frontside & backside. 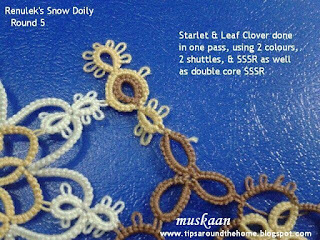 Hence the name FS/BS tatting which employs DS & RODS. 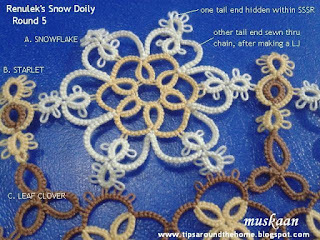 There are many tutorials that explain & demonstrate it much better (I didn't have time to take pictures of actual tatting). 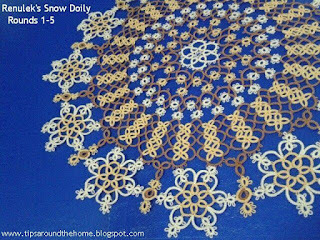 This post is meant more for the symbolic representation of stitches. I would truly appreciate any feedback, criticism, constructive suggestions for improvement. I do intend to add actual tatting pics in subsequent posts in this series. 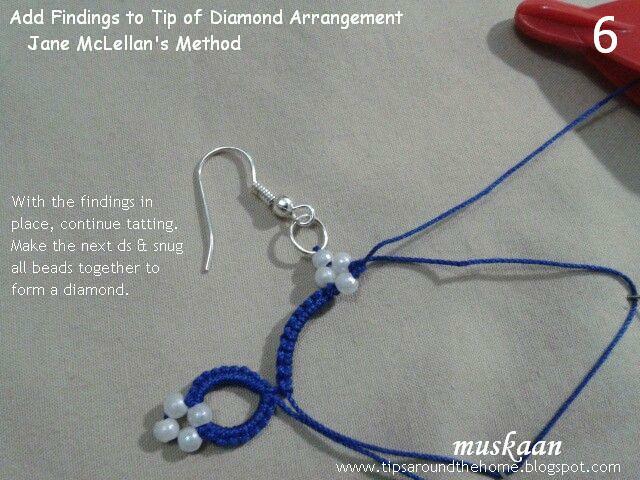 At the time I went ahead by inserting the finding through the space between the 4 beads, as you can see in pic above. 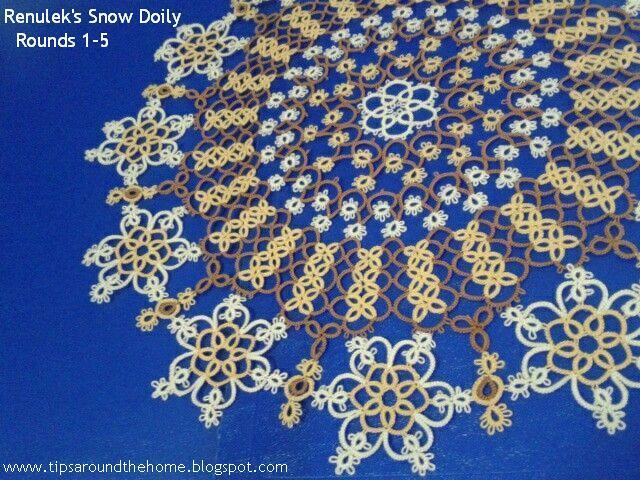 But the puzzle kept gnawing at me & I sought answers in the Online Tatting Class, etc. Everyone was very helpful, with lots of suggestions & tips. My sincerest thanks to the OTC team (Cyn, Mel, Barb, Tammie), to Georgia who sent me an email presumably after reading the conversation, & to Jane Eborall for her prompt replies to my emails. Your collective interest & promptness in trying to resolve the issue was very heartwarming & inspiring. But the person who Finally “solved” this was our other Jane from exciting safari land,while multitasking ! I received a reply, with tatted sample pic, within a few hours ! Hence, the following pictorial is Jane McLellan’s Method of adding findings to the tip of a diamond arrangement of beads, on a ring. Normally, when we want a diamond arrangement of beads on a ring, we hold 3 beads in the loop around hand, & slide 1 bead from the shuttle thread. Note : All 4 beads were pre-loaded on to the shuttle. 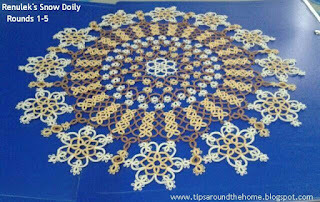 When the next double stitch is made & snugged, the beads position themselves in a diamond shape. 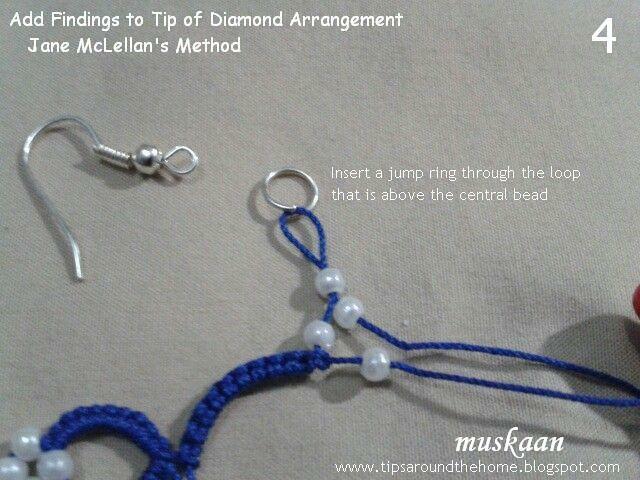 In order to add a finding in this arrangement, a jump ring or split ring will have to be inserted through the topmost bead. BUT : The bead hole has to be large enough for the wire to pass through easily, & without fraying the thread. Moreover, the jump ring will be held stiffly in place & may cause the hook (or earring) to curve unnaturally in another plane. 1. 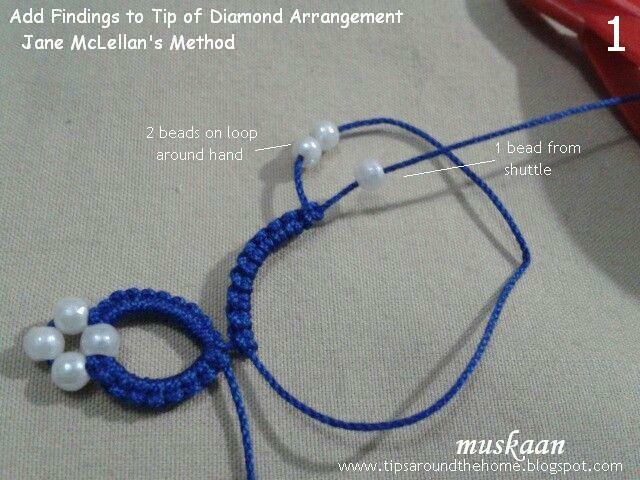 Load only 2 beads around hand & bring forth 1 bead from shuttle thread. 2. Load 4th bead on a hook & pull a loop of thread from BETWEEN the pair of beads. 4. 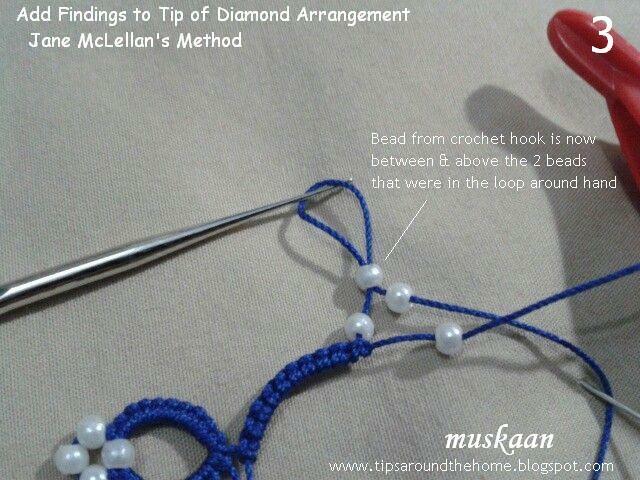 Insert a jump ring or split ring through the ‘picot’ loop. One can insert an earring hook directly on to the loop, too. 5. 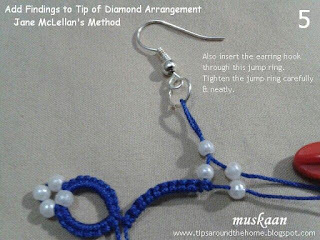 The earring hook can be inserted into the jump ring now, or earlier. 6. 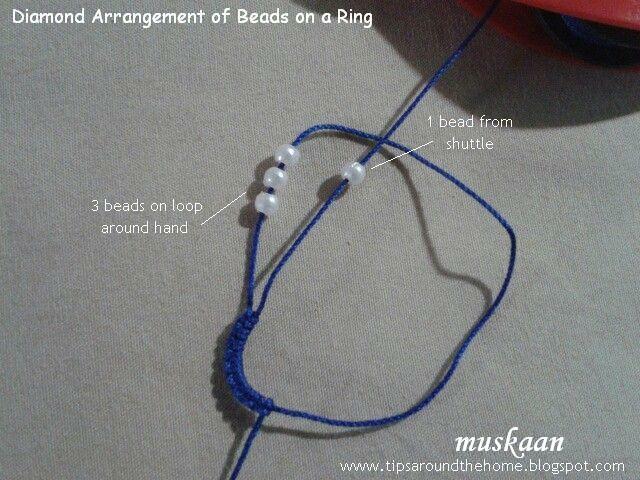 Snug the beads & loop into position by pulling on the core thread. 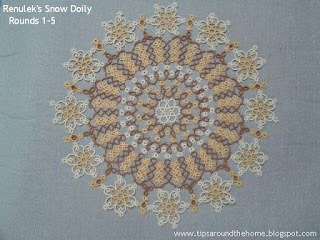 Then make a double stitch & continue with pattern. 7. Complete the ring & close. 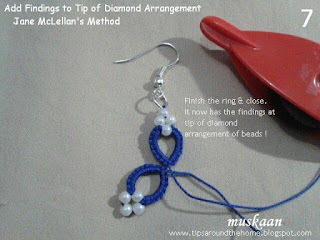 With proper tools, the earring hook or any other finding can be added directly to the loop. Add more than one bead to the tip, if one wants longer dangles. 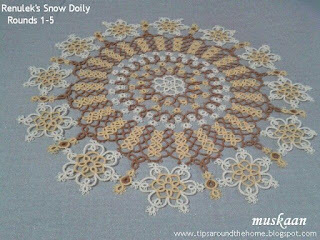 This tutorial was pending for such a long time ! Tonight, though, Georgia will be teaching the earring pattern in the OTC, & hence the impetus to post this post-haste ! 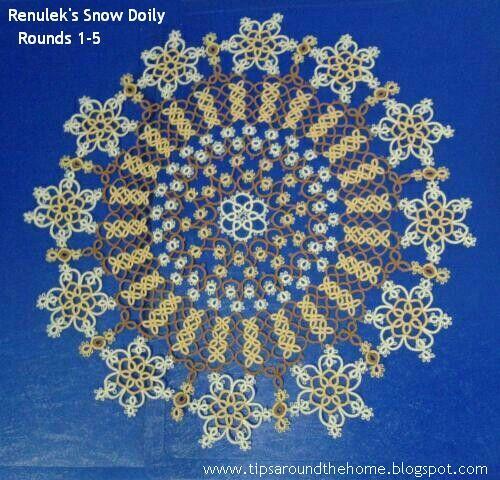 Round 5 consists of 3 separate motifs, joined to each other & to previous round. Next there was the problem of colours – which colours to use, how to show them up at the right places, how to hide a particular colour, and so on. And of course, the problem of hiding multiple ends! I tried to balance practicality with pleasure, trying to be as precise as I could. AND I got to learn a new technique, which Always generates immense interest & excitement ! 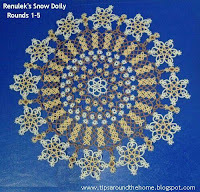 A 2-round snowflake that can be tatted in one pass by using split chain. 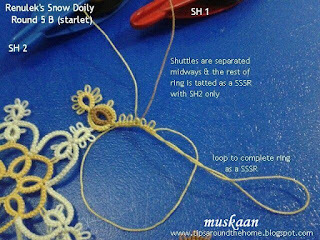 Techniques required : 2-shuttle tatting for outer round; Floating/Thrown ring. 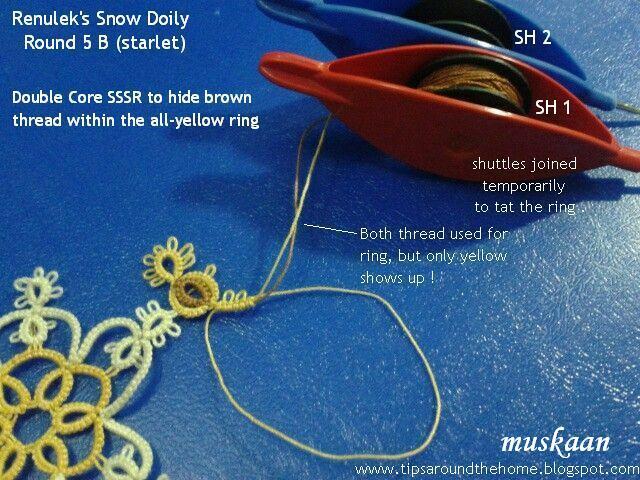 Techniques I used : FS/BS (RODS) tatting ; Floating Ring ; SSSR ; LJ . Row 1 (yellow) – Made them all together. For 1st few, I hid the tail ends using Frivole’s finishing on a chain method. But since I was still sewing in the remaining tails under a few sts, I decided to simply go traditional (& practical). Knotted the tails, then sewed them under to hide. With size 40, knots are not discernible , Yay ! 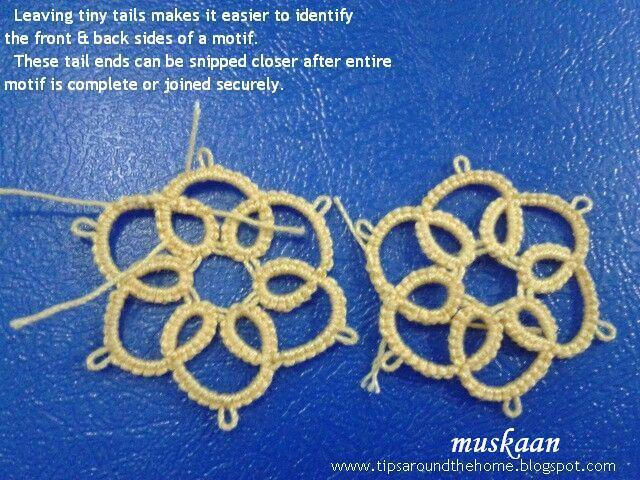 TIP : I tend to leave part of the tail ends visible till the motifs are completed & attached. 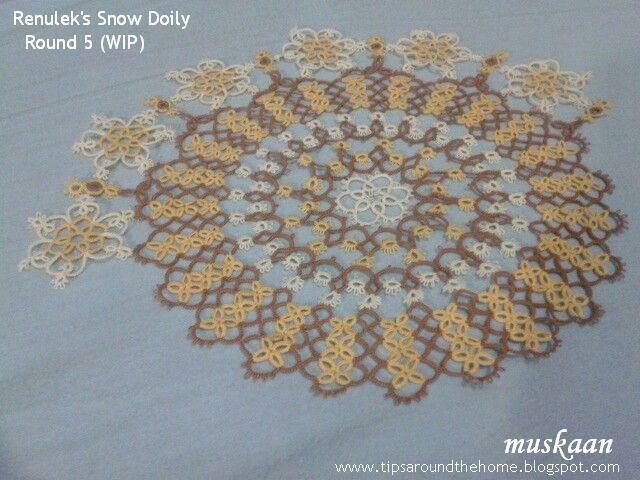 It helps to easily identify the front & back sides of the motif. 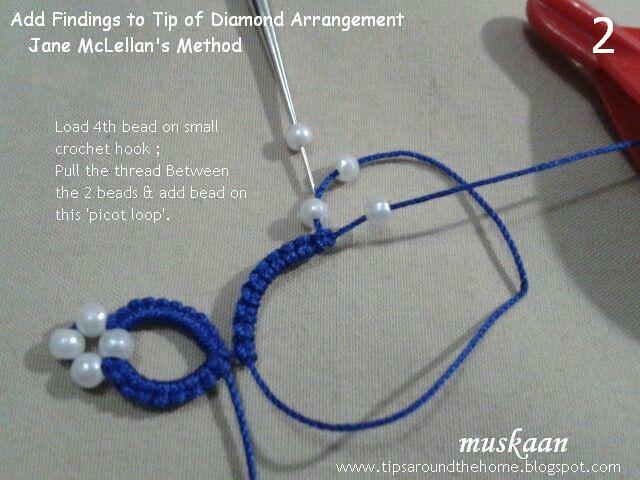 TIP : One can use tiny picots at base of the thrown rings, to anchor them. However, considering that all 6 of these are joined to some part or other, I dismissed the idea. Would’ve been even pretty fiddly, too. Practicality ruled. 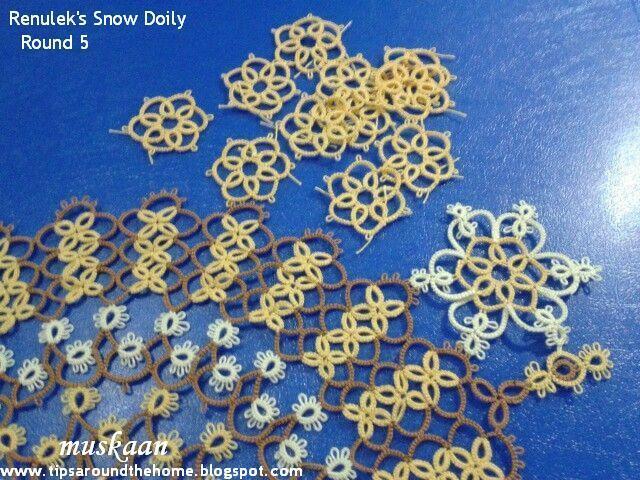 These are very tiny motifs, especially in size 40, for me. Hence when these came up, I tried to use a little brainpower – surely they could be tatted together ?! Easy with single colour, but with 2 colours, in predetermined positions ? I tatted the 2 parts together using Brown in SH1 & yellow in SH2. 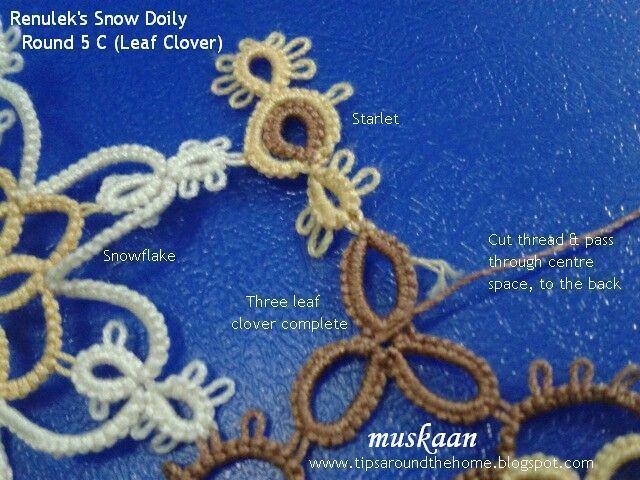 It can be started from either end ( I tried one starting with clovers, followed by starlet) but I preferred starting with starlet & ending with clover leaves. Learned & applied Double Core Single Shuttle Split Ring* to hide the brown in the yellow ring, when moving from starlet to clover (main steps indicated in pics below). Part of the Starlet is complete, joined to snowflake. Now trying to hide brown within a yellow ring. 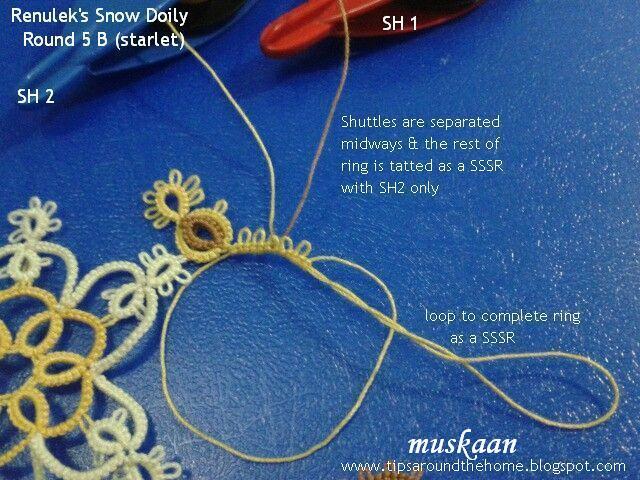 Instead of SSSR, one can continue with SH2 to complete the ring normally ! 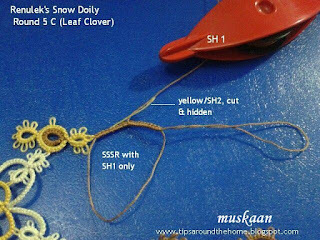 Then cut & hide yellow thread. Yellow tail can be hidden within this ring or to previous yellow ring. 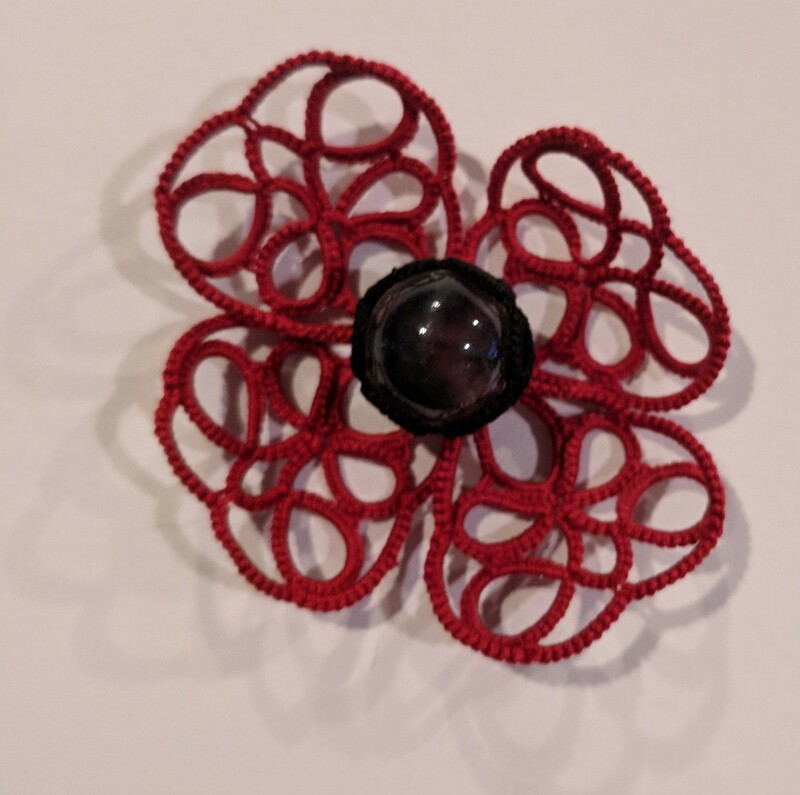 Techniques required : 2-shuttle tatting; Floating/Thrown rings; Onion Ring join ; Lock Join. The 2 motifs are tatted separately in original pattern. Techniques I used : FS/BS (RODS) tatting ; Floating Rings ; SSSR ; CWJ (for onion ring join) ; LJ ; Double core SSSR and later, Double core Ring ; Reverse Join. I tatted the 2 motifs in one pass, using 2 colours. 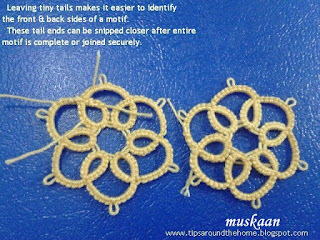 I have prepared a diagram, with instructions, to show how I did this motif. Click to download file. Double core SSSR – quite a mouthful, right?! And if one really deconstructs it, this is only partially applicable. 3. one can complete the ring as a normal ring with the visible colour, as in this case. This technique allows us to tat the complete ring in a single colour, while hiding one colour And positioning both threads as required. So in a SSSR, both threads emerge together at 'opposite' end, as in a split ring. But if one completes the ring as a normal ring, then the hidden colour emerges at one end, while the visible colour comes back to the base of ring ! 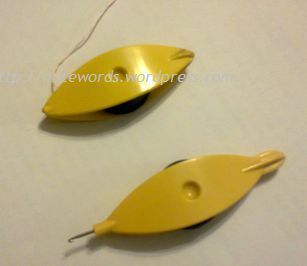 This also gives me more options to hide/sew in the yellow tail ! 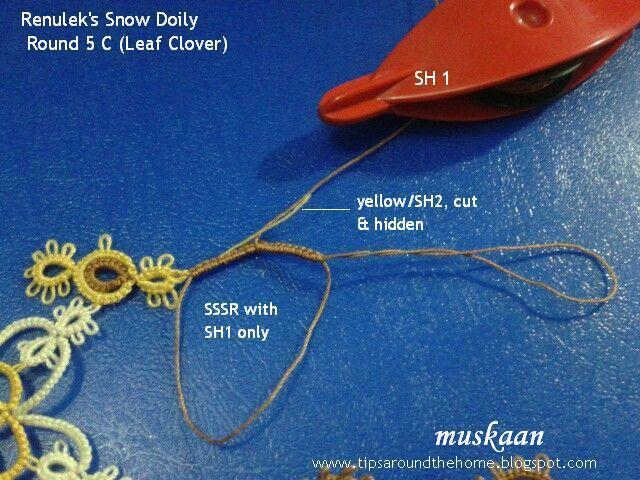 unlike in the double core SSSR, where the yellow thread emerges at opposite end, along with brown. However, before posting here, I decided to do some more hunting. The first place to look is always Jane Eborall’s blog & sure enough there was the tutorial on Double Core SSSR with Two Colours Or how to crawl out of a round while using 2 colours and keep the SSSR one colour! 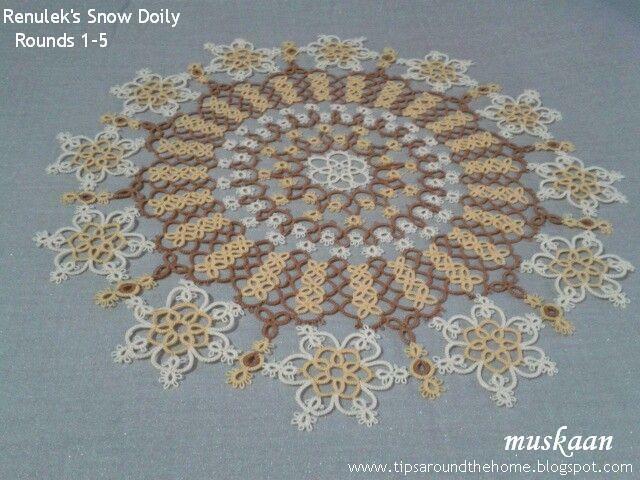 And that also revealed that this technique was originally conceived by TattingChic in 2009. 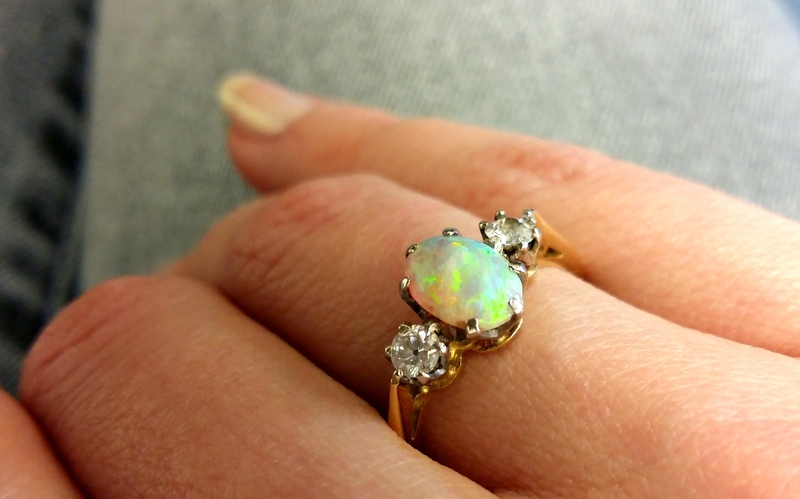 Read all about that interesting experiment & process (with pics) in her blogpost titled “A Tale of Two Split Rings” . I like how the brown clovers form a defined outline for previous round - almost like a large flower ! 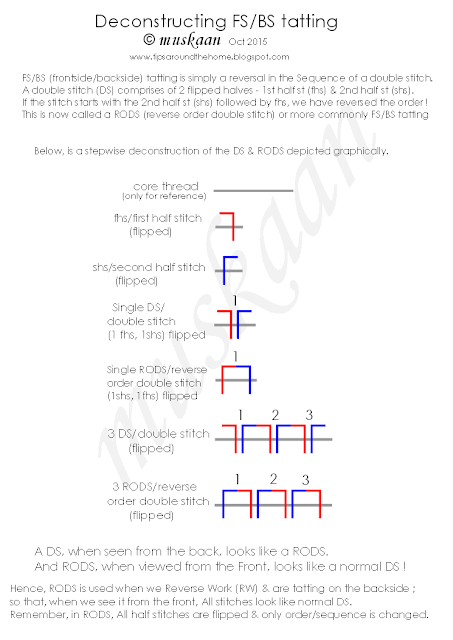 RODS – reverse order double stitch for frontside/backside tatting. The brown doesn't quite show up against the blue background ; but colours get muted against the pale b/g ! What I considered to be ‘routine’ repetitive rounds after Round 5, have suddenly perked up my interest. And the very latest includes new learning again – Join to Smooth Side by Anne Dyer. More about these in next post .